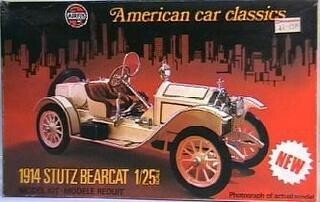 This detailed 1/25th scale kit of one of America's most famous vintage sports cars captures the racy lines of Harry Stutz's design. A two-seater powered by a 6 1/2-litre side valve engine, the Bearcat was claimed to posses a maximum speed of 80 m.p.h., no mean achievement for a car of that period. Chromed parts, rubber-like tyres and a miniature engine are just some of the features of this eye-catching model.